I loved both the picture by Donna and your drawing of it! Thanks, Kathy! I liked yesterday’s Neocolor version better, but it was fun to get jiggy with pencil marks in this one. Donna has sure found a terrific place for birding in Florida, hasn’t she? She’ll have us all packing our bags. Glad you enjoyed this! I think you do quite well on your own! I love seeing your different interpretations of the same image. Wonderful! Thank you so much! This photo is a glorious wonder to work from, for sure! Glad you’re enjoying it! More wackiness tomorrow, this time with a cow from Donna’s post in abstract colors. Enjoying the semi-abstracts lately. Thanks for your encouragement! Really nice! Love the strokes. Thanks, Jodi! Time to fly! 😀 hehe Thanks for your feedback too as compared to yesterday’s, I appreciate it. Hi Laura, a wonderful new version. I’ve read the other remarks and it’s hard to come up with something new to say, I agree with everyone. I love your posts and your free spirit to explore your talent. Have a great Monday. You have a great eye. It shows in your sketches. You added energy with the color. Nice!! Thanks, Carmel! Hope you’re feeling better! Thanks so much, Jill! It was fun and helps to work out the angst too, making these expressive marks! Glad you liked it! I love them too, glad you do too, grlie! Thank you! Expressive lines! Stay warm. Enjoying your bird! Thanks, C! Glad you enjoyed! I’m so glad you pointed me to this one, Denis, as I missed some posts over the holidays. Love your images of this bird! Thank you! And glad to hear you enjoyed this one as well. 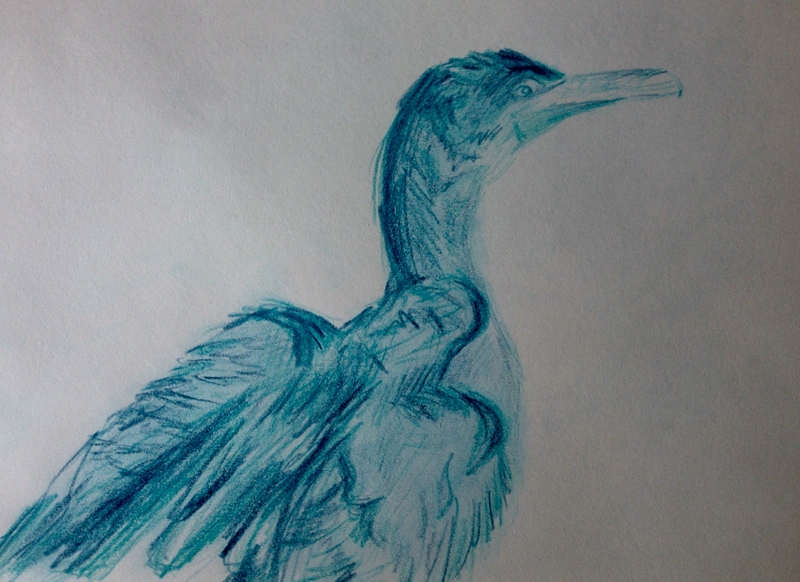 Wonderful sketch Laura – a positive energy is flowing from the bird. Love the calming blue. Thank you, Mary! Trying to conjure up just such a thing. So glad it translated. Have a great day, friend.